Urban sprawl ready to overrun the rural area. See more scenes at Scenic Sunday. Nice contrast, albeit a touch sad. The city is overrunning the farms and fields where I live, too, and it's nowhere near as large and urban as this city appears to be. The constantly spreading interface between urban and rural is something we well know in the Sacramento Valley. We are part of the problem, I fear, living on the new frontier. 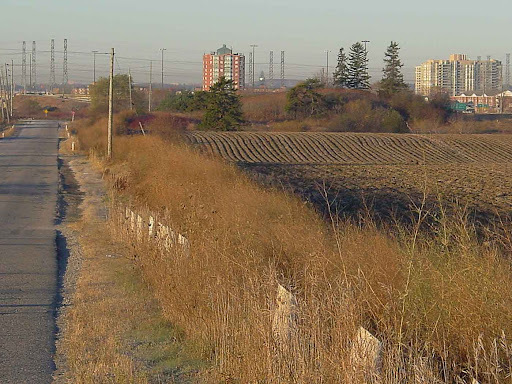 It is always a shock when you come across some farmland so close to the city. And very sad. It is great to still see farmland. It is disappearing fast. That's quite a contrast between the farmland and the tall apartment blocks. We're seeing the same thing where I live with unrelenting growth (although the growth has just about stopped the last couple of years). Very nice vista. Love the lighting and the dusty coloring. imagine the time when there was no machine, it will really break my back to till this with a hoe.